"I feel helpless and lost in all this, like I'm far removed, but I don't want to be." "I want to be part of making change, not to just sit idle. " "As a white pastor, what are my boundaries? What is off limits and what is not?" "At what point do we take a risk?" "How do we know if our 'constructive conversations' are helpful, or just more noise?" "I serve a small church in a rural, white community. I'm feeling called to do something here, but I need guidance to know where to start." "I'm concerned about the reality of fear and mistrust that my students are growing up into," (from a youth pastor). "I'm struggling with how to make this real for my people. They shake their heads and feel empathy, but they see no real need for action or change." Today my preacher friends are asking, "What can I--should I--tell our people this weekend?" It's a hard question. And not just for preachers. Truth is, we all have 'people,' those in our sphere of influence--neighbors, co-workers, friends, our children. What can we say to them? Take a look at chapter 4 in the biblical book of Esther. The entire Jewish community was in a perilous place. People feared for their lives. Leaders are in disagreement and disarray. Finally, one leader, Mordecai, tells another, Esther, this is not the time to quibble, be quiet, or quit. "Maybe it was for a moment like this that you came to be part of the royal family" (Esther 4:14 CEB). Before we consider what to do, it's helpful to know what not to do. Don't Quibble. In the biblical story, Esther was going back and forth, not accomplishing anything. In a moment of crisis we realize that we no longer have time for debates, for arguing over slogans, over whose lives matter, over perceived failures in media coverage. We can no longer spend time disputing the fact that racism is in us, and is killing black men, women, and children. We can no longer 'other' each other to death, over more than just race. We don't have time to spend critiquing the individual lives and motives of victims or police officers or public officials. We have been "majoring in the minors," as Martin Luther King, Jr said. Don't be Quiet. Esther scurried around hoping to silently manipulate an outcome. It doesn't work. Our prayer vigils and moments of silence have become shallow, easy alternatives to actually using our voices as God calls us to do. 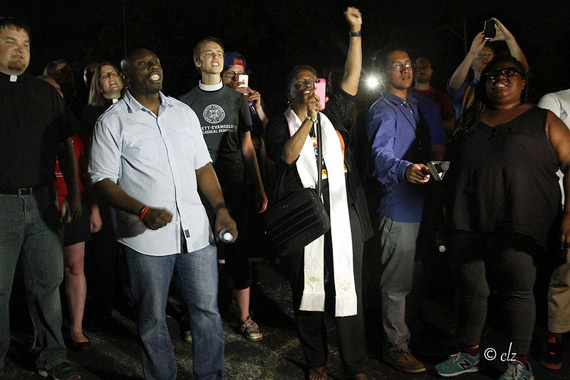 We can no longer merely host and organize prayer vigils for reconciling that which we have never experienced. We can't keep preying on each other and then pray for forgiveness. We can't pray for God to do what we are unwilling to do ourselves. Quiet is safer, sure. A pastor friend in Nashville told me recently, "I'm learning to better engage in conversations about race. I know I will make blunders, but I won't be quiet any longer." Don't Quit. "For a moment like this" translates as now. We can't sit around in our ashes, thinking the time to act has passed, or not yet arrived. It is not a singular time. It is always, every time. It is life in Christ--not a single event or action but ceaseless, constant, ongoing. Anne Frank said, "How wonderful it is that nobody need wait a single moment before starting to improve the world." So, the pressure is off! We no longer need to find the right time. It is always now. Acknowledge that everything is not right, with ourselves first, and then with our systems and our world. Affirm one another's pain, understanding that it is real, and that the other's pain is also our own pain. Act in ways that bring healing and hope to those places of pain. Acknowledge that all is not right, and do it truthfully. Don't be afraid to say "I don't know." The scriptures don't even do much to explain why. The Bible shows us how to get through life, but it rarely if ever answers why. Be transparent. If you don't know something for sure, say so. Don't make things up. Don't say things that sound good but have nothing behind them. Affirm that the pain--yours and mine--is real, and that it is connected. There's a scientific theory that illustrates this idea: quantum entanglement. "At the simplest level, the idea of entanglement is just the idea that two things that are separated in space can still be the same thing," says NPR Science Reporter Geoff Brumfiel. "You can have an object that exists in two different spaces and is still the same object." (http://www.npr.org/2015/01/30/382453493/mirror-touch). What has newly been discovered is that these particles within objects still remain connected even though they are physically apart--when one particle becomes excited, so does the other. What moves me, moves you. What hurts me, hurts you. What inspires me, inspires you. In affirming another's pain, we affirm that we are entangled in it. When we become entangled, we are changed. In order to affirm we must listen, and model listening for our people. Affirm that others' experiences are real, even if they are unreal to you. Emanuel Cleaver III, a pastor in Kansas City, expresses the conundrum of black parental and pastoral counseling. "If you are a black man and you are stopped by the police," he says, "here is what you do: Comply with everything they tell you and then pray they don't shoot you anyway." This is reality for millions of people. Make space, time, and place for listening and affirmation in your community. Pastor Traci Blackmon says "we must hold open a space for grief" for people to process their pain as part of community. I don't know what that will look like for you, but I believe you can figure it out. 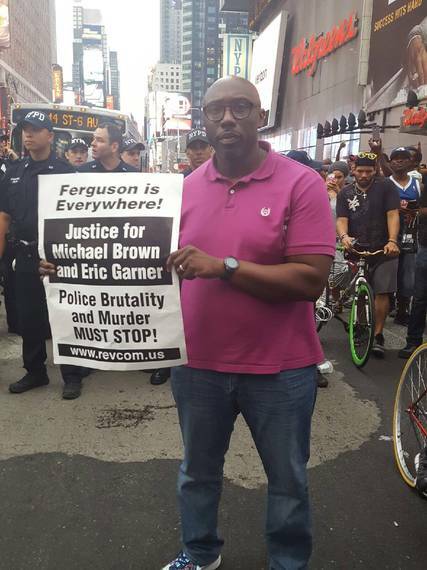 Thursday night I sat on the pavement with a crowd of protestors in New York. That's an action, sure. But then what? As a pastor or faith leader, there is more for me (and you) to do. It is "go time." We are to ACT in ways that bring healing and hope. There is no escaping our responsibility. None of us are exempt, no matter our political bent or church setting or social location. No matter that we feel helpless and lost. Not knowing what to say or do is a shared experience, from pulpit to pew to parking lot. Many pastors are afraid to risk with their congregations; and congregations are afraid to let their pastors be real, let alone be prophetic. When a man asked Jesus to heal his son, he said, "I have faith," and then "help my lack of faith." (Mark 9:24 CEB) You can have faith and still wonder why or when. What's never in question is who. It is clear who needs to help, who will be the source of help and hope. That's Jesus, through us, by our action. 1. Get out of the micro. Move to the macro. Preach grace. What can you do in your community to get everybody under the canopy of grace? What steps can you take to realign yourself and those in your influence with the fact that grace is real, unmerited, for all, for always? 2. Be relational, move in, get closer to the points of pain. Talk with people you don't know. Get to know them and their reality. Now is not the time to sit back. 3. Find ways to bind people together, to facilitate quantum entanglement in your community. 4. Examine the civic structures and policies and systems that need to change. Work cooperatively and productively with others to change them. Invite others--your people--to join you in this work. 5. Speak out and work proactively to change gun laws. No more quibbling, no more. 6. Bring light and life. Every day, do things in your personal and public spaces to lift yourself and others up. Enjoy creation. Love life. Make joy. Don't stay in the heavy. Turn off the TV. Wherever we are, I pray we are holding up our corners, lifting hurting people to Jesus, lifting the hope of Jesus for others to see. Like the old hymn says, '"if I be lifted up I'll draw all people unto me." F. Willis Johnson is pastor of Wellspring Church, a United Methodist congregation in Ferguson, MO. His forthcoming book and video study, Holding Up Your Corner: Talking About Race in Your Community, will be available from Abingdon Press in December 2016.